Does your child love superheros? We've officially entered the superhero phase! Yay! Chuck was Super Man for Halloween. Now he constantly requests to wear his favorite Batman shirt... with a clip on tie (go figure) and requests superhero books from the library. I really wanted to encourage his imagination with a fun superhero craft, but wasn't sure what I could easily (and cheaply) make. Awhile back I made him a no-sew Superhero cape that he still wears around the house. But after remembering that I had a bunch of red contact paper lying around, I realized that I could also make him a DIY Bat Signal too! 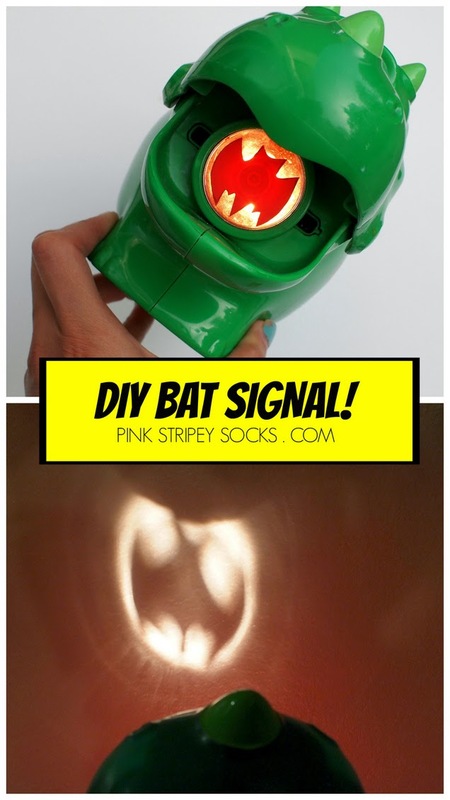 DIY Bat Signal! Ka pow! 1. Trace your flashlight's light. 2. Doodle on a bat signal. 4. Trace that bat onto a piece of contact paper. 6. Stick it onto your flashlight's light. Now you can call your favorite superhero whenever you want to!